The reasons for delay in diagnosis have been analysed in a series of 190 biopsy-proven sarcoidosis in one centre in Calcutta during the past 25 years. Overwhelming presence of tuberculosis in our country was mostly the reason for the misdiagnosis and delay. Some factors, responsible for late diagnosis were, however, peculiar to our country like frequent change of attending doctors, mistrust for an unusual diagnosis, reluctance or refusal to have proper and unusual investigations (in spite of being offered free to most), fear of invasive procedures etc. These were all patient-dependent factors. However, inexperience of physicians, misdiagnosis as tuberculosis, continuation of tuberculosis treatment even without response, misreporting of chest radiographs as tuberculosis, lymphoma or other diseases, wrong interpretation of biopsies, and use of steroid before diagnosis etc. were all physician - dependent delaying factors. Immunotherapy is used as a method of treatment in patients with bronchial asthma, but its usefulness is limited to highly selected patients. Measurement of IgG antibodies act as indicators for improvement of patients after hyposensitisation. Skin test responses both immediate and late phase cutaneous reactions were also used as a parameter to evaluate the effect of immunotherapy (IT). 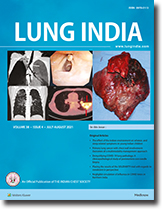 Fifty patients of perennial bronchial asthma of confirmed diagnosis were selected and given immunotherapy. Twenty one (42%) of the patients showed reduction of the skin test response for both immediate and late phase cutaneous reaction (LPCR). Twenty nine (58%) showed reduction for LPCR alone and none showed reduction for immediate response alone. Immediate reaction after immunotherapy was not significant at p<0.05 and LPCR is significant at p <0.05. It is observed that the patients who showed reduction in the skin test reaction also showed a reduction in the symptoms and drug score. Results indicate that LPCR can be a better indicator for the improvement of immunotherapy. Respiratory complications are common in patients with pancreatic inflammatory diseases. They can vary from asymptomatic pleural effusions to life threatening conditions such as Adult Respiratory Distress Syndrome (ARDS). This is a retrospective study of all patients admitted under Medicine and Surgery in a teaching institution, with pancreatic inflammatory diseases over a 2 year period - January 1993 to December 1994. Ninety four patients with pancreatic inflammatory diseases were studied. There were 54 cases of acute pancreatitis of which 12 were Acute Hemorrhagic Necrotising Pancreatitis, and 40 of chronic pancreatitis. There were 31 respiratory complications : 13 pleural effusions, 17 pneumonia/pneumonitis and 1 case of ARDS. Four of the patients with pleural effusion were dyspnoeic, requiring complete aspiration of the fluid. One patient with Acute Haemorrhagic Necrotising Pancreatitis (AHNP) had an empyema, requiring an intercostal drain for 3 days. Ninety one patients recovered after appropriate therapy. All 3 deaths were in patients with AHNP : 1 was due to ARDS and 2 were due to intraabdominal sepsis with pneumonia. Respiratory complications were most frequently seen in patients with acute hemorrhagic necrotising pancreatitis and they contribute to the prolonged hospital stay and increased morbidity and mortality. In a tertiary care hospital on out patient basis we observed that the prescribed medication with inhaled bronchodilators and steroids was not being taken by the patients. To study the patient-related factors we conducted a questionnaire study to know the possible reasons for non-compliance with inhaled drugs. It was 56.25%. 82.6% were compliant with oral medication. Cost of medication was the single most important factor for non compliance. We report 6 patients of rheumatoid arthritis (RA) on methotrexate (MTX) who developed pulmonary toxicity. A brief account of clinical features, therapy and prognosis is given. An extremely rare case of miliary tuberculosis of lung is reported who had pneumothorax on one side and pleural effusion on opposite side. Possible mechanism of such presentation is discussed.